One of the things that has intrigued me about the evolution of CAD software, has been the development of specialized software over the years. When I first got into the CAD field, there were already a fair amount of CAD packages out there, but most were just as the acronym implied, computer-aided drafting programs – tools for creating general drawings. Don’t get me wrong, the advent of utilizing a computer to create technical drawings, as opposed to using drafting boards, pencils, T-squares, templates and angles was a very welcome change. Those CAD programs were used for all types of projects: manufacturing, architectural, civil, structural, MEP and more. While you can still use most of today’s CAD software for all those types of projects as well, time has yielded very specialized CAD packages with tools designed to handle design and drawings for specific industries. Overhead Line Electrification (OLE) is one of those specific industries. OLE is the process of utilizing an overhead line or wire to transmit electrical energy to trams, trolleys, trains and other light rail vehicles. Zebraware Ltd, a software vendor based in the United Kingdom, has recently announced the release of their newest software product – Linear Draft. Linear Draft is a 3D BIM OLE design package that is compatible with popular computer-aided design packages such as the latest releases of Bentley Systems Microstation and Autodesk’s AutoCAD. - PRECISE AND COMPREHENSIVE 3D COMPONENT MODELING - Details are precise to the manufacturers designs, and the accuracy of the modeling helps your team to design directly for construction, gaining a better view, earlier in the design life cycle of exactly what will be built. - LIVE PREVIEWING - Whenever a structure or piece of equipment is built or edited, the user has a live preview of exactly what their finished build will look like. - 2D SCHEMATICS - 2D layouts, including symbology and annotations, are produced automatically when you create your 3D structures and wires. These layouts can also be configured to client standards. - BIM ASSET DATA AND DETAILED USER FEEDBACK - Individual asset data is produced automatically along with each component that is built. The software handles all the tagging and asset creation for you. 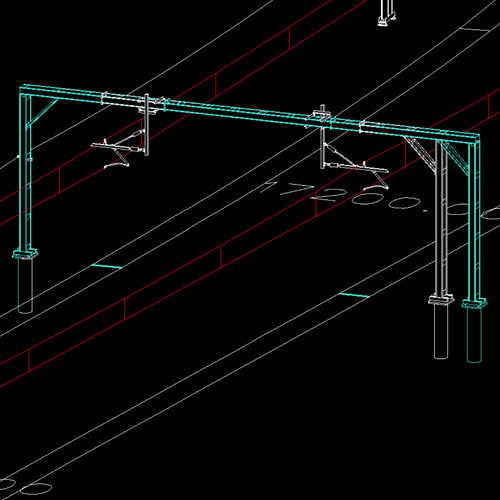 - CROSS SECTIONAL VIEWS - Linear Draft also produces a live cross sectional or elevation views for allocation design and clash detection. - EXPORTABLE REPORTING - The user is able to export reports directly from the 3D model. Simple templates can be used to create your reports or you can edit your own. These features allow the user to design OLE in 3D using simple interfaces. Meanwhile, in the background, Linear Draft is creating the 3D solid models, 2D layout & plan view schematics and the structure elevations. If a user makes a change to any part of their design, the 2D and 3D elements all update automatically. Linear Draft makes design change much safer by reducing the iterative error and raising deliverable quality. Linear Draft is available in three different editions – Standard, Pro and Ultimate. There are also add-on modules as well that can help to augment your OLE design workflow - LinearElevation, LinearSimulate, LinearCheck and LinearAdmin.